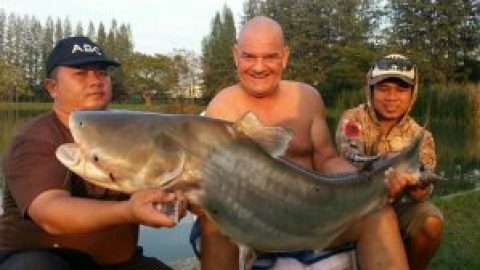 French angler Dinah and her husband decided to visit Pilot 111 fishing Ponds near Bangkok lure fishing for the various species. On arrival at the complex of ponds the anglers were soon fishing with medium weight spinning outfits casting at various likely looking holding areas. After several pulls through the swim one of the lures was savagely attacked by a Giant Snakehead. After playing the Giant Snakehead for several minutes the fish was promptly landed by the guide. Further casts saw both anglers hooked up with Giant Snakehead as they continued to work their way round the fishing pond. 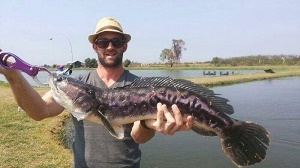 By late afternoon both anglers had landed some fantastic looking Giant Snakehead to an estimated 4,5 kg. The anglers decided to change the focus of their attention towards some of the other species residing in the ponds. Dinah and her husband switched over to an adjacent pond and were soon rewarded by several good sized Asian Redtail Catfish which tested their spinning outfits to their limit. The days fishing at Pilot 111 fishing ponds continued in much the same manner with both anglers regularly scoring with the Snakehead and Asian Redtail Catfish in addition to bagging several smaller sized Barramundi. ©2019 Fishsiam Co. Ltd. All rights reserved.